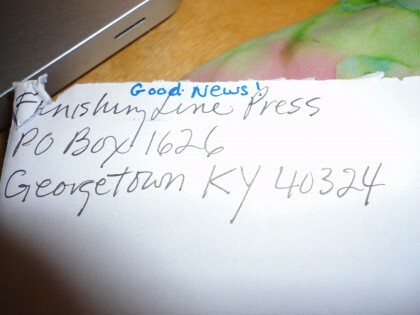 Anyone who’s ever sent out a poem or a short story to a literary magazine or contest in the snail mail knows the drill about including the required self addressed stamped envelope, known by the acronym SASE. Before the dawn of e-mail, these babies were the only way a writer found out whether or not her work was accepted for publication. If the envelope was thick, it was likely to be a rejection. If it was thin and light, the answer might be good. Then again, maybe this particular journal only sent a rejection slip and did not return the actual manuscript. So naturally seeing one of these in the mailbox was fraught. The writing of these sonnets is a little victory all its own. I have never been one to work much in forms. And especially not the sonnet. But in the last few years, I have worked to find a way back “in” to the place where poems come to me. Not having access to that place due to the cognitive slowdown and what I call “the big beautiful blank” as my mental roommate has been one of the hardest things the MS has “handed” me. I know it’s not something that most people would even be able to or care to do, let alone miss, but for me it’s been wretched to have lost it, or to find that when I try to return to it, the ” way ” seems to have disappeared. Back in 2010, my family of origin was going through a very tough time. I felt largely helpless, and set a friend in a Buddhist monastery and a group of Roman Catholic Womenpriests to meditating and praying for them. During such times I usually write, because it’s something I do in the face of huge transitions. But I was having serious trouble finding where to start. One of my dear long time friends, who is not a poet, but who encourages me to keep being one said, “what are those little ones, you know, the Japanese name?” Haiku. And we laughed. I said, yes, maybe I could manage 17 syllables. So on my walks with Romeo I started practicing coming up with haiku. I thought they were pretty good, and so did another long time poet friend of mine, but, as is so often the case, an editor at a haiku journal didn’t agree with us. Nevertheless, I had hit on something. Having a form to work within was helping my brain ‘find” the place where I saw and heard poems again. Along those same lines, another very long time poet friend of mine suggested an excellent workbook of exercises often used in the kind of creative writing classes I had once taught. The very first chapter in the book gave three approaches to writing a sonnet. I had seen this one by Carol Light featured at the Poetry Northwest web site that was so subtle and elegant, at first read I had missed that it was a sonnet at all. I loved it so much I wanted somehow, someday, to write one like it. And so the journey began. Now all I had to do was find a rhyme scheme and twelve more lines. (Keep in mind that in graduate school I had gotten around the sonnet assignment in my poetic forms class by writing one that skirted it by having the speaker in the poem commit imitative fallacy: that is, claiming he was speaking in the rhyme scheme of a sonnet just because he thought he was, though he really wasn’t). I got a stern look and an exasperated sigh from my teacher Charles Wright. I decided to take the rest of the assignments more seriously, and got better as a result.) Though I had baulked at them earlier in my life, the requirements of form actually helped me know where to look to “hear” a line. And, silly though it might sound, I could use my hands and fingers to count, as I lay on the couch, waiting to hear the next words to try out. My hands could both write down lists of words that might work that rhymed, and, better still I could count syllables on them. Now this might sound remedial to the point of mockery. But a long time ago I had read, in part, a fascinating book by Frank Wilson called simply, The Hand. It described how the hands are literally extensions of the brain, and we can know things directly through them. This corroborated the reason why I needed to touch things when my mind went blank about them, as a means of “finding” what I might have been considering about them. So counting syllables and sounds on my fingers seemed like a fine entry point, even if it wasn’t as flush an approach as my once photographic memory had given me. When I completed this sonnet to my general satisfaction, I had no idea if I would ever write another one again. I thought I probably wouldn’t. As with all things magical and miraculous, I no longer remember the exact time frame, but I do remember sitting in the depths of Powell’s Book Store in Portland (another rare delight of a trip full of “firsts” to see my son Mike and his girlfriend Kelly). While Mike was working as a production assistant on Portlandia that summer, Kelly, Romeo and I had taken the bus down to this legendary store I had never been inside of. She had gone to check out art education books, and Romeo and I were settling in on an aisle of the poetry section, me on a small stool, he stretched out on the floor. I was running my fingers over all the book spines I might like to pull when I saw the title Bright Star lying with its cover face up on the shelf. I touched it, and then never put it down. Named after a sonnet by John Keats, this is also the title of a film by Jane Campion I had seen and loved about the life of Keats and his love affair with Fanny Braun. Now I saw that there was an edition of sonnets and letters on which she had based the film, with an introduction about that process she had written herself. My fingers couldn’t let go of it. And so I brought it home with me. In the preceding months I had begun feeling well enough to make a commitment to myself to “sit with poetry” each morning, even if it was just to check out what was featured on Today’s Poem or to comb my many journals from the days I could handwrite at length to see what there was in them I might be able to work with. My cognitive slowdown requires that I be “cued” somehow as to the entry point in any sequential task. So I doggedly provided myself with these opportunities to serendipitously discover a “cue” I could follow. One such success came at the confluence of these two activities, and resulted in a poem that was published in the literary magazine Pilgrimage. Though not a sonnet, it was my first publication in 3 years. And the first “blind” submission accepted (meaning no one I knew in the poetry world was associated with the journal) in many more than ten. Meanwhile, I read every word in Bright Star. I watched the film again. And a strange and wonderful thing began to happen. I started to remember my 19 year-old self, sitting out on the quad in front of the university library, reading the famous Keats poem “Ode to Autumn.” How I had loved it so much I had literally petted the page. And that this was the moment I had decided to try seriously to write good poetry. I wanted to do something that lasted, that “stayed forever,” in my 19 year old way of putting it. And it also sent me to the bookshelf in my room, where the anthology from my Romantics Poetry class still sat. It had survived the ravages of a terrible purge I made of books at the end of college when I had been convinced by an abusive boyfriend that I would never be anything more than a boring pedant. In an effort to rid myself of this image I had dumped many of my books into the Good Will bin. But even in the midst of that painful madness, I could not bring myself to dump the English Romantics. So they were still on my shelf. An edition edited by John Perkins, with wide thin skinned pages like those in a bible. Perhaps the most compelling result of this immersion was the realization that we cannot know how our work will be received, or what effect it will have. But it can’t have any if we don’t write it. That Keats had died thinking he would be forgotten. But he had written anyway, though he wrestled with wrenching despair, and faced a fatal case of turberculosis his training as a junior surgeon made clear to him, despite the breathtaking misdiagnoses of doctors who gave him care. And he had had a very active sense of humor about things the stereotype of him handed down to us never allows for. So I found myself a friend who had lived 200 years ago who could help me hear lines. Despite the difference in our ages and times, we were kindred spirits of a sort. Not in the images given to each of us by those around us, but in our own approaches to what is beautiful, the strange hybrid of passionate diligence and desultory lack-a-daisy that was been a part of each of our writing processes, and the suffering that is part of being alive. So I wrote. And walked with Romeo. And wrote more. Sometimes I could hear the music of the iambic count in my head, without my fingers. It was as if someone were speaking in me, but letting me choose my own words, and set my own life to this music. And thus my sonnets were written. The page limit for the contest was 26. Though I have more than these written, I chose to go with 25 of them that fit together well, in honor of the 25 years of life the poet who seemed to have sat with me in some strange way as I wrote them had lived. And for luck. Basketball players have their lucky socks and jerseys. I guess I had the spirit of Keats to help me find my “game.” And of course the fruits and veggies and grains and beans I eat all the time (and the fat I stay away from) to help train my brain back to finding its own joyous creative inclinations. That good news is that my chapbook placed 2nd Honorable Mention out of 334 entries to the contests. And the even better good news is that they want to publish it. This is not a big publishing deal. It’s a small literary press. I’ll be paid in copies, and be required to rustle up 100 names and addresses to be notified in that old fashioned way, 55 of which will have to want to make a prepaid order to the press so they can afford a press run. But still, I’m over the moon. And hopefully, when the time comes and the publication schedule is set, there will be enough interest to make this happen. And I’ll let you know more details, so you can join in the literary fun if you like. First of all, the fat free vegan way of eating gave me back the legs to start walking again with Romeo. That movement along the creek, past the trees I love, in all kinds of weather, under changing skies, gave my brain the room to find the words again. Little by little. Step by step. I don’t like calling them baby steps. The baby I had didn’t do things like that. He jumped in all at once, for better or worse. It seems to me that going slowly is an acquired kind of body wisdom, one that comes from learning to listen to the body, rather than trying to trick or force it. It doesn’t resonate with me either that succeeding at eating fat free and vegan requires training yourself to place “mind over matter,” as I’ve read some people insist. Perhaps that’s true for them. But for me, it’s more like getting my mind and my body to listen to each other again, and enjoy working together. Eating whole plants and starches has allowed my body to assume its rightful role in supporting my mind. And I love what it’s had to say. I wouldn’t be sharing this incredible news with you if I wasn’t living this fat free vegan lifestyle. So if you are on the fat free vegan path, keep eating this way. If you’re thinking of giving it a try, give it a genuine one. And be patient, trust your body and its process of healing. Whatever your own heart’s desire, by doing so, you will help yourself create and receive your own good news. Congratulations, Maria, and thanks for sharing your process in writing and in living a healthy lifestyle. I can’t wait to get my copy of your book! Thanks so much, Susan! I’ll keep everyone posted on publication details as I learn them. what a lovely story. I too would like a copy of your book. And I love how you related your healing diet to your creative expansion. A message that is very helpful for me to hear right now, when I am inclined to overlook the work of healing and focus on the limitations, not the benefits. I’d love a copy as well, as long as I am not taking it out of someone else’s hands. Thank you, Nicole! I so appreciate your noticing the connection between healing and creative expansion. It is an amazing process to me. And yes, of course I will put you on the list. I would be honored. The more people who want it, the more they will print!! Who knows, I might get enough interest to prompt the “huge” print run of 500 over the usual 250. LOL. Congratulations, Maria! I am thrilled for you about your ‘good news’ – and so thankful to your eating regime that has enabled you to write again the poetry you love and that you have found your ‘poetic mind’ again, thanks also to Keats. As I would feel bereft without my reading and music (I can no longer play) I can understand your joy at being able to write your sonnets. This recent entry has so many interesting off-shoots to explore – not least rediscovering Kiwi Jane Campion’s beautiful film ‘Bright Star’. I do so look forward to your blog writings – they are always so uplifting. Many thanks for sharing yourself and your gifts – and the recipes. May there be many more ‘envelopes’ for you in the future! Hi Kiwi Fan! Thanks so much for your congratulations and your beautiful comment. I so appreciated reading of your own love of reading and music, and how you understand my joy in writing the sonnets (with thanks to Keats). Also your interest in exploring all the “off-shoots”–I love how you put that–including rediscovering sister Kiwi Jane Campion and Bright Star. I think I am going to have to watch it again too! I am still smiling at all your good wishes. Here’s one for you: may you somehow, someday play again, or whatever equals or transcends it for you. Congratulations Maria! I would love a copy, too. Your story of healing has really touched and inspired me. Thank you! You’re welcome, Caroline. And thank you so much for reading this post, and letting me know you would love a copy of the chapbook. I will be posting again about it when I know more specific dates for publication and ordering. You made my afternoon! Such good news, indeed! I want a copy, will send you my snail-mail address, and will prepay as they request so that the printing can be run. I am so happy for you! Thanks, Ellen, you are an angel!! It means a lot to share the joy with you! I am over the moon happy for you too & I must know how I can prepay!!!! Would write more but computer is in the shop -it’s sick and I am fine. Lol!